The picture was taken by a Press and Journal photographer and appeared in the Aberdeen paper on 21st January 1995. The location was Laggen near Huntly. The taker said..... I heard a noise in the forest and caught sight of a big cat. Its coat was glossy black in the light and its tail must have been almost 3ft long. The article states that rudimentary computer enhencments revealed a recognisable cat shape. The remains of a sheep were found near the woods the previous month, and local farmers had reported loosing sheep. 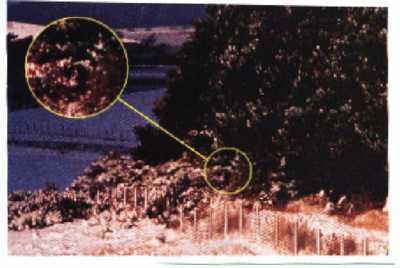 When I first saw the photo in the Fortean Times I contacted the Aberdeen Press and Journal in the hope of obtaining a copy of the pic. They insisted that no such pic ever appeared in their paper and kept on sending me one of a horse! Steve Bain has been in touch with me concerning the photo. The sighting is genuine but the photo shows nothing. He tells me that he was running hard across snow and ice and his only photo was of a field where the cat's tail had disappeared into bushes. He said that despite the number of reports in the papers at that point he was unprepared for his own sighting and that the shock was "unbelieveable". 'It's a shame you refer to my sighting as a 'Fuzzy ABC' considering I was running flat out at the time on snow and ice! Over the past years, someone always mentions the cat that I met on the hillside that day. Even though through my work as a press photographer for the Press and Journal I had come across many sightings by various people, when I finally saw it for myself the shock was unbelievable. Over those months when we had loads of sightings I had found it hard to believe, even after seeing a sheepskin rug was all that was left after an attack near Huntly. A reporter and I even joined a hunter to try and track down the animal in the Bin forest near Huntly. I am convinced as many people are now due to the Welsh boy being attacked, however it's a shame that not even one cat has been caught recently. The picture, which I shot, running towards the car with the camera behind me on motor drive, only showed a field where the cat had jumped through the bushes with its tail sticking out. There were casts taken of its paw prints, but we could never get the proper feedback from the Rowett Institute. I also saw a sheep carcass which had tremendous claw marks which was also taken there, but again we could not get any follow up info. Anyway, Interesting web site, I'll keep a lookout for that Cat! It won't get away next time! Head of Photography, Press and Journal/Evening Express.